The creeks of Mecklenburg County are small, and, to many eyes, unimposing. 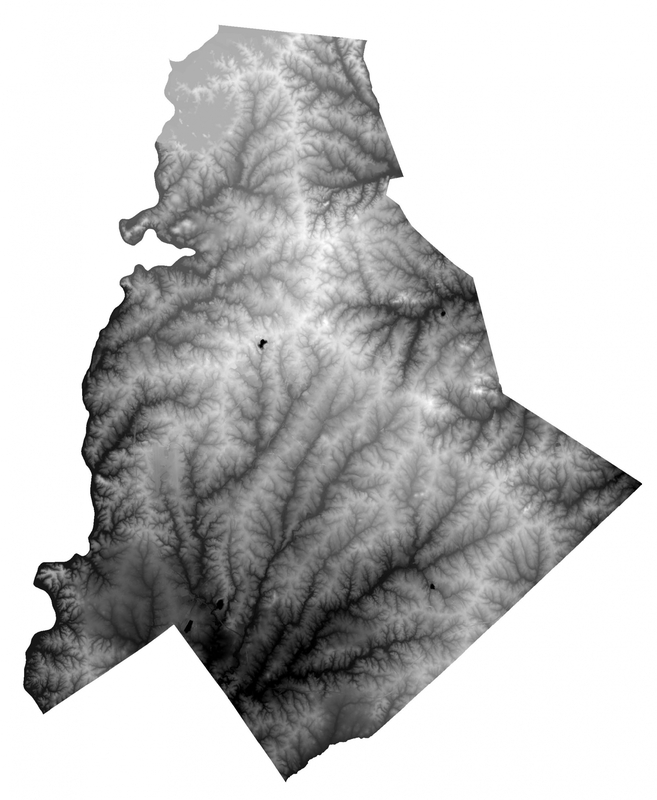 But their lacework connects neighborhood to neighborhood throughout Charlotte in an intricate and important network. This is the story of a city filled with creeks. The story starts in springs and backyard ditches, in storm drains and highway culverts, in protected woods and neglected no-man’s-lands. They all lead, in the end, to the Atlantic Ocean. 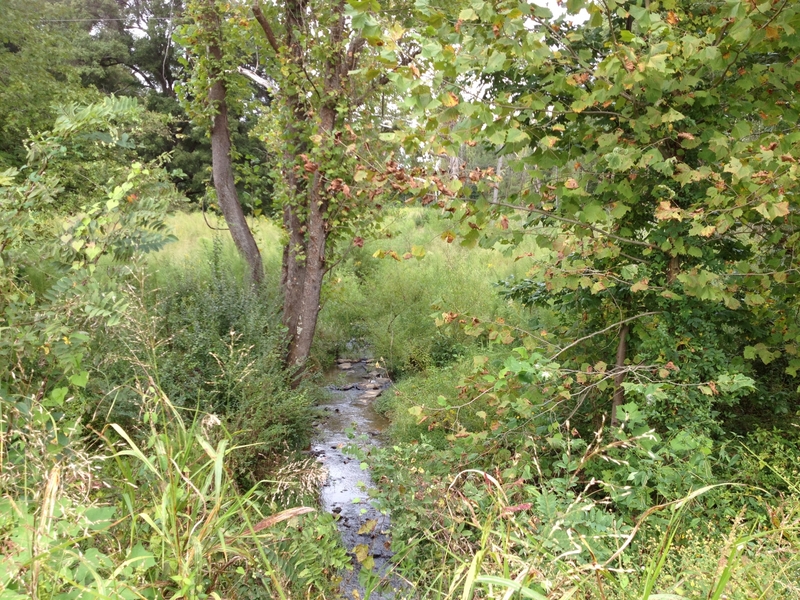 Mecklenburg County has 3,000 miles of creeks. Those 3,000 miles, laid end to end, would stretch from Miami to Vancouver, Canada. 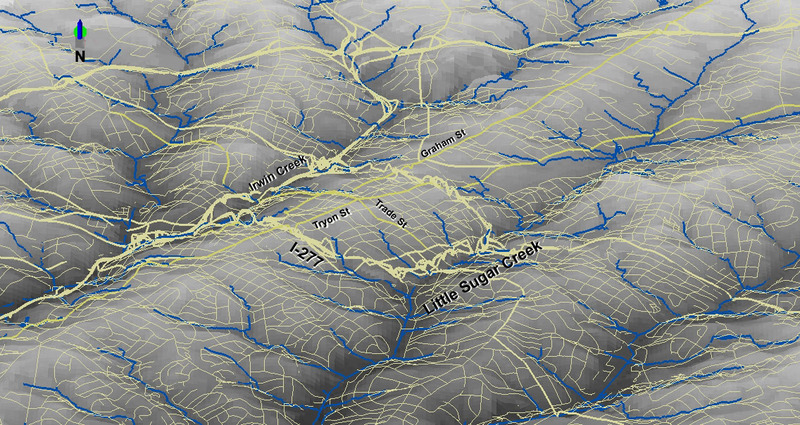 Of those creeks, 126 have names. And all but two of the creeks that course through Mecklenburg start in Mecklenburg. That has implications. The rivulets remain. But delightsome? Read on. Of those 3,000 miles of streams, about a third have water year-round, the others only during wet seasons. They may be ditches or spring-fed seeps, not recognized as small creeks but seen as little more than nuisances in a heavy rain. Many have been imprisoned in pipes and culverts. But each trickle, ditch or pipe is an infinitesimal piece of the 3,000-mile network – a network connecting neighborhood to neighborhood, ravines to rivulets, creeks to rivers, and on to the sea. That is the setting for the story of KEEPING WATCH on WATER: City of Creeks. 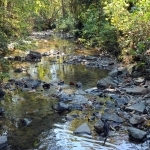 The research for this project focused primarily on three of Mecklenburg County’s major creeksheds: Little Sugar Creek (including Briar Creek), Irwin Creek (including Stewart Creek) and McDowell Creek. Each has its own personality and tells a different chapter of the larger story. Little Sugar Creek has been called a scourge and a deadly nuisance. It arises in an inauspicious, murky puddle near North Tryon Street and tumbles through the middle of Charlotte. Because of its visibility, its ills have generated the most publicity. Almost half a century ago a local newspaper reporter undertook a major investigation into its appalling pollution. Yet since 2010 it has become a symbol of restoration, after the creek near uptown was freed from beneath concrete parking lots and gained a popular section of greenway. But are its waters, in fact, restored? And can other suffering streams experience a similar renaissance? Environmental protections of the past 40 years have diminished pollution from industrial pipes and sewage plants. Yet all the county’s creeksheds today are deeply troubled. 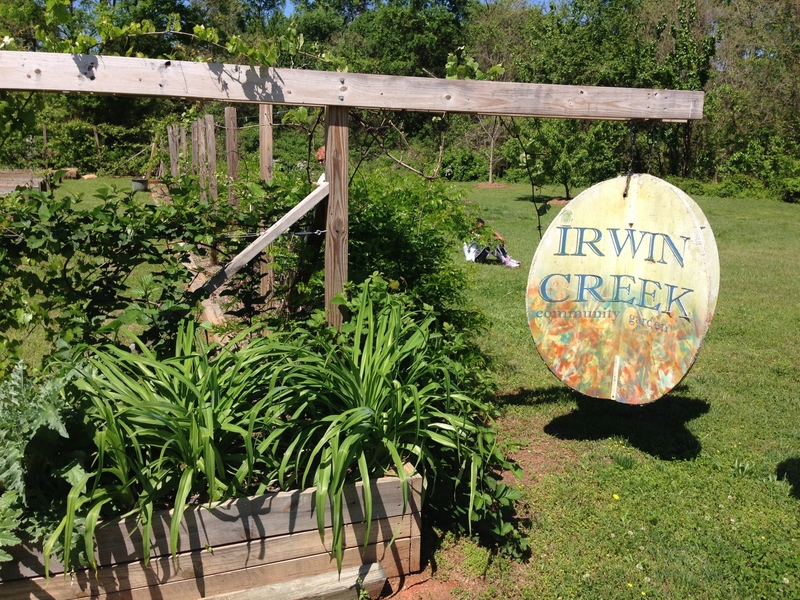 Irwin Creek’s waters once slaked the thirst of a growing city. One of its west Charlotte springs nourished an African-American neighborhood built near it. Its pools and tributaries cradled fish, coached swimmers, baptized believers. But nurturing a city came at a cost. 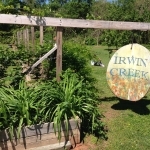 As it flows from a nature preserve to an interstate, Irwin and its tributaries carry the sins of decades gone as well as the present: heavy metals from an industrial past, pollution from aging sewage pipes, runoff from acres of asphalt. Yet those who know the stream well say Irwin still holds beauty and promise. It would take decades and millions to undo the problems, say experts. But Irwin Creek is no lost cause. If there is a dark side to development, you find it in the waters of McDowell Creek. Red clay runoff from north Mecklenburg County’s runaway growth clouds the creek, choking insects, smothering plant life. Worse, the creek pours into Mountain Island Lake, the drinking water source for much of the county. McDowell is a snapshot of the way development pollutes, but it’s also a picture for what a community can do when it awakens to a threat. Restoration and cleanup are underway throughout the watershed. There’s a chance to do what may not be possible inside Charlotte’s heavily built urban core: stabilize a stream, restore habitat and set a course for a cleaner future. 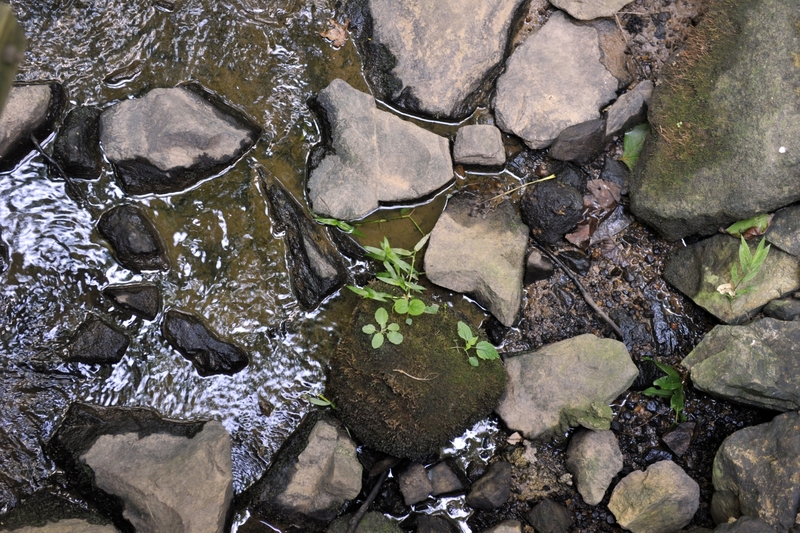 The larger truth from those three creeks applies to all of Mecklenburg’s streams: Environmental protections of the past 40 years have diminished pollution from industrial pipes and sewage plants. Fish and waterfowl swim again in formerly toxic places. Creek restorations, stricter ordinances and a growing system of greenways bring hope for wider renewal. Yet amid those positive signs, all the county’s creeksheds today are deeply troubled. Today the creeks are, for many people, barely an afterthought. Yet those small waterways, barely noticed today, were essential in shaping Charlotte’s settlement and its transportation patterns. Topographical maps show a defining ridge slicing south from north Mecklenburg, then cutting southeast. That ridge marks the divide between two large river watersheds. 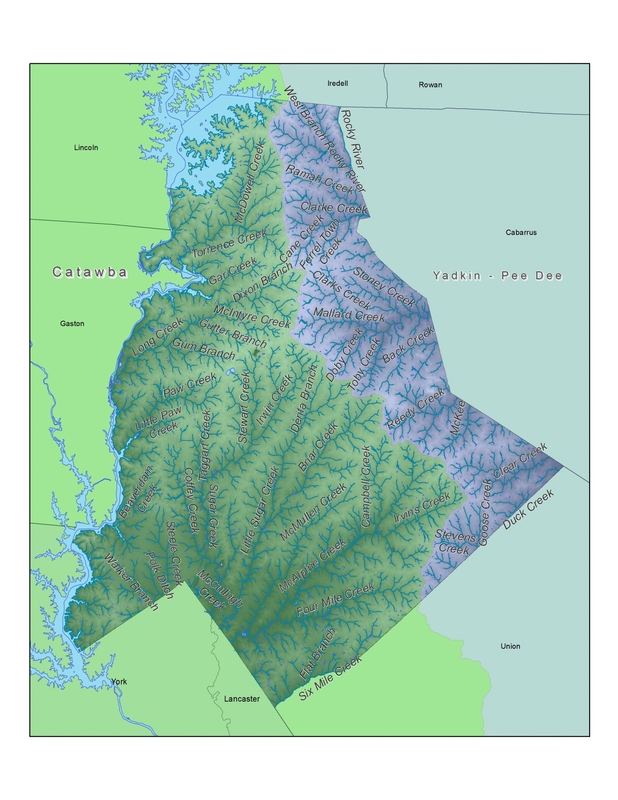 Most of Mecklenburg is in the Catawba watershed, but about a third drains east to the Yadkin-Pee Dee. Pore over a map and you’ll see how, even today, Main Street in Davidson follows that ridge. So do parts of North Tryon Street. It was there, on the high spots between the creeks, where land was drier, that Native Americans developed trading paths, routes that later drew European traders and settlers. At one ridge crest between two creeks, where the famed Occaneechi Trading Path met another, settlers laid out a village, Charlotte. 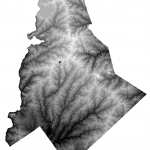 5 The city’s earliest street grid followed those northeast-to-southwest ridgelines. That’s why uptown Charlotte streets don’t run north-south and east-west. Even today many major Charlotte roads – and railroads – run atop ridges. When Hezekiah Alexander settled here in the 1760s, building a rock house so sturdy it still stands, he sited his home next to a cluster of springs on a Briar Creek tributary, depending on the springs for cool, safe drinking water and to help preserve foods. Other settlers dammed creeks for water power to run the grist- and sawmills that drove an early economy. 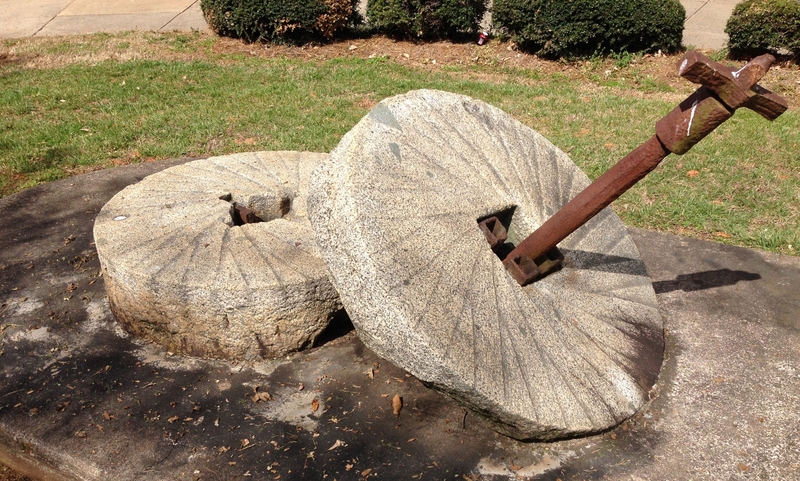 Stewart Gray of the Mecklenburg Historic Landmarks Commission, in an essay on the old Long Creek mill in western Mecklenburg County, describes the mills as civic, social and commercial centers: “Taxes were collected at the mill. Voting took place there with politicians literally speaking while standing on stumps.” He recounts political campaigning along with fighting, with “whiskey, cider, watermelons, and ginger cakes” being passed out. 6 “The mill was just one of those undeniable community centers,” Gray says. The creeks were a resource, yet the locals did not protect them. They used them for sewers. Farmers let livestock muddy the banks. New factories dumped chemicals. People built homes and businesses on creek banks and floodplains, then blamed the creeks for flooding. 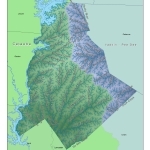 By 1912, Charlotte’s municipal drinking water intake had moved from Irwin Creek to the Catawba River (now Mountain Island Lake), north of where most Mecklenburg creeks drain into the river. So whatever Charlotteans dump in their creeks doesn’t, for the most part, taint the city’s drinking water supply but hits the Catawba River east of Rock Hill. 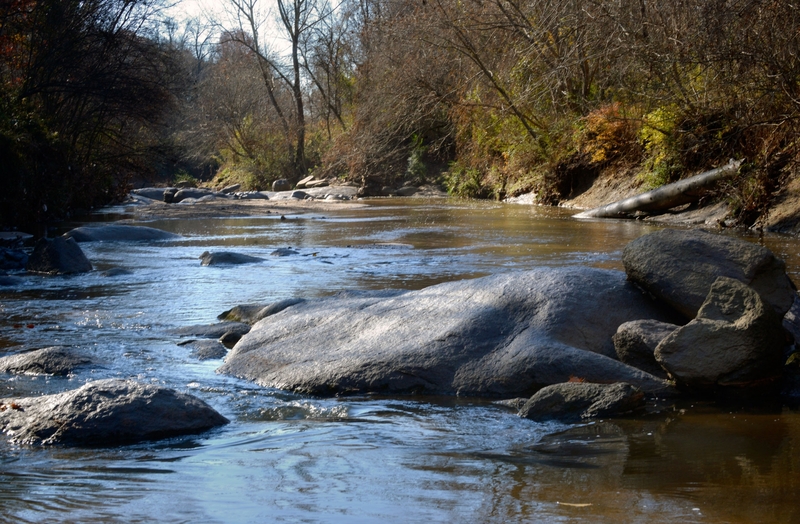 Kayakers who paddle the Catawba where Sugar Creek joins – carrying the waters from such major Charlotte creeks as Irwin, Stewart, Little Sugar, Briar and McAlpine – report seeing plumes of trash and sediment. Yet while some of the city’s creeks were shunned for years as filthy, at the same time they offered welcome recreation – swimming and wading and fishing. During the days of strict racial segregation, black citizens were barred from city swimming pools, and the creeks offered swimming holes. 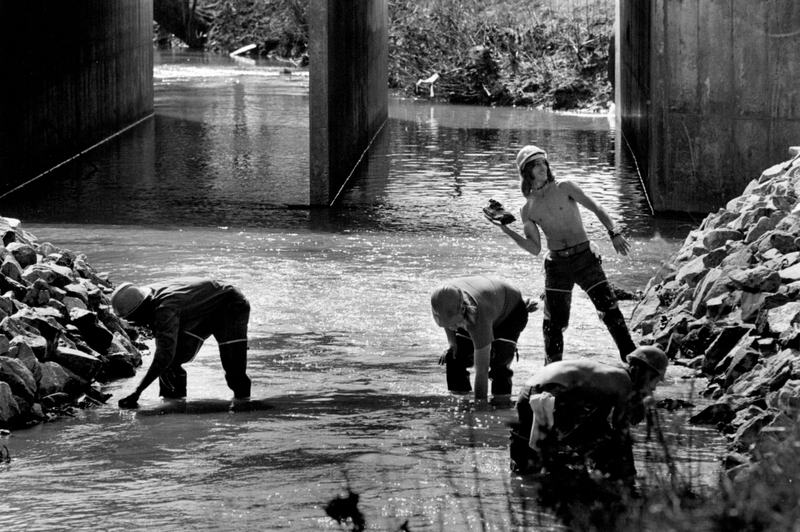 Attempts to get stricter on creek pollution started in the late 1940s, with a city ordinance to ban piping industrial waste into city creeks. After a 1969 Charlotte News pollution investigation, the county created a Department of Environmental Protection. But it wasn’t until after the federal Clean Water Act of 1972 that cleaning the nation’s surface waters began in earnest. 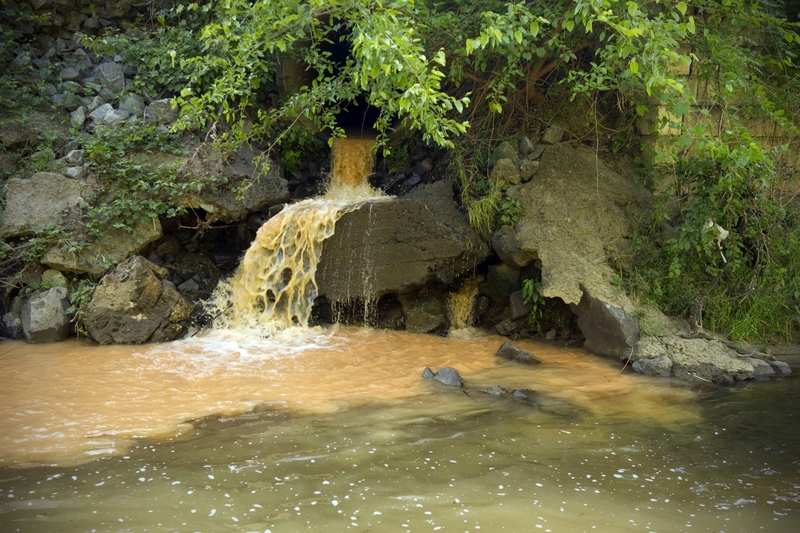 The law targeted chemical and sewage discharges into rivers, lakes and streams. It didn’t – still doesn’t – forbid all potentially toxic discharges. Instead, it requires permits that sets limits and requires dischargers to abide by them. 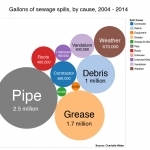 Slowly, as industries and municipal sewer plants began to comply with tougher laws, waters around the country improved. Remarkable change has come to some of the nation’s most nastily polluted urban waters. At the same time, scientists’ understanding of natural systems grew more sophisticated, challenging conventional wisdom of 20th-century engineering, that dredging and straightening streams and channeling them into concrete would control flooding by speeding the water downstream. For most of the 19th and 20th centuries, Charlotte and Mecklenburg County put few restraints on development close to the creeks and their floodplains. Ever-increasing rooftops and ever-expanding asphalt for streets and parking lots meant less soil for rain waters to soak into. Those impervious surfaces sent even more runoff speeding into the creeks, which still overflowed their channelized banks. 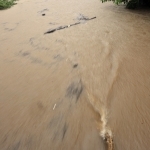 To learn more about flooding, click here. Not often in the dry world of public policy can a tectonic change be traced to one board of county commissioners’ meeting. 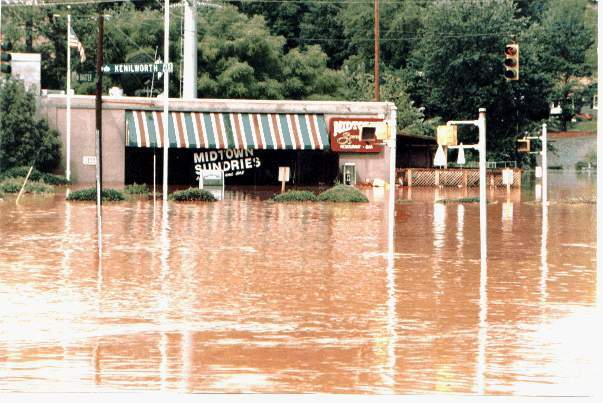 But in the history of Mecklenburg’s creeks, the night of Sept. 26, 1996, was monumental. Rozzelle made a presentation to the county commissioners describing the sad state of the creeks. Less than a month later, on Oct. 15, commissioners unanimously adopted a policy that creeks should be suitable “for prolonged human contact and recreational opportunities” and aquatic life. The goal was a reach. To comply would mean far-reaching changes in local development patterns and business practices. Mecklenburg’s streams, by state standards, were deemed suitable for only incidental human contact. Further, most provisions that would affect development – watershed rules for the lakes, tighter floodplain ordinances – typically suffered months or years of tortured debate by stakeholder groups. 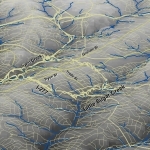 The Creek Use Policy the county adopted led to the eventual adoption, after lengthy negotiations with developers, of local ordinances requiring a 35- to 100-foot (or the entire floodplain, whichever is greater) vegetative buffer beside most county creeks. It also served to – finally – forbid most building right next to creeks. “The theory now is, let’s let the floodplains do what the floodplains do, as best we can,” Rozzelle says. And what floodplains do best is hold floodwaters. Despite the goals of the 1996 Creek Use Policy, almost 20 years later the county’s creeks still aren’t generally suitable for prolonged human contact. 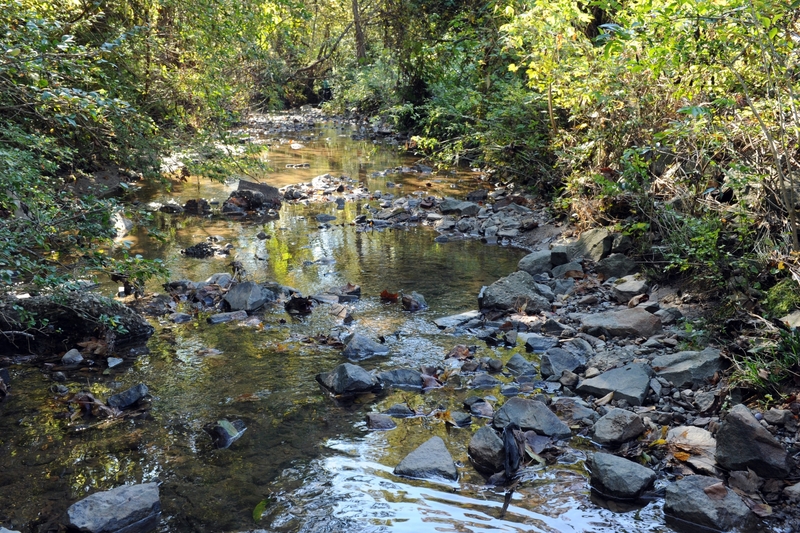 Today, Mecklenburg creeks are deeply troubled. 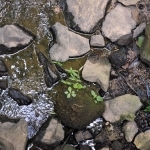 Click image to learn the condition of the creek near where you live. To view the legend, click on “View Map Legend” below the map. The problem today isn’t factory pollution. 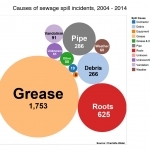 Most industries send their wastes, some of it pre-treated, into the municipal sewer system. Today, the biggest threats to the creeks are buildings’ roofs, pavement and bacteria. The most prevalent pollutants are sediment from runoff and bacteria from feces – which can come from wildlife, pets or, often, sewer pipes. 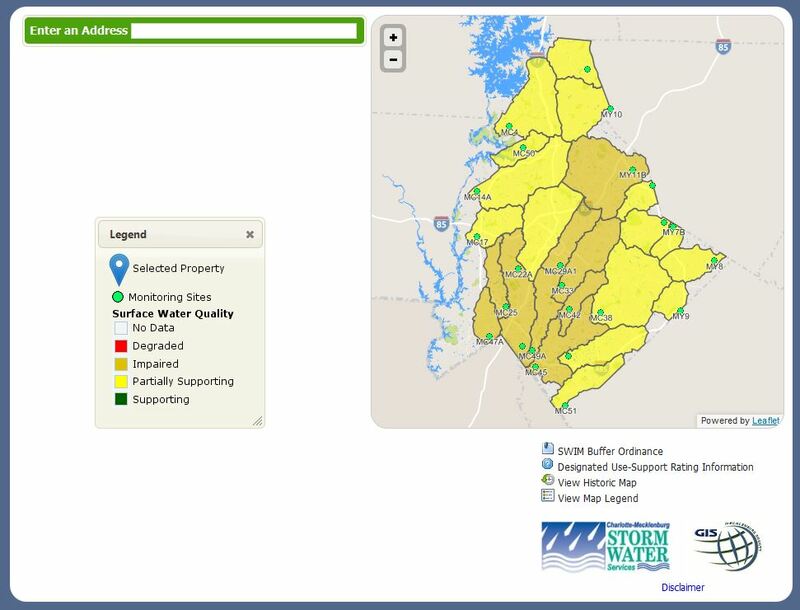 To get an idea of the size of the runoff problem, picture this: A one-inch rainfall on the impervious acreage throughout Mecklenburg County would create an estimated 2.4 billion gallons of storm water runoff. If you put all that water into gallon milk jugs and stacked them, they’d reach to the moon and halfway back again. In addition to bacteria and sediment, other common contaminants are metals such as zinc and copper and nutrients such as nitrogen and phosphorus, often from lawn fertilizers or even from sewage treatment plants. So as the terrible industrial pollution of the mid-20th century has improved, the county’s once-rural creeks have been degraded, primarily from construction, development and runoff. The county’s 2014 State of the Environment Report rates today’s creeks, in the main, as only fair, not getting much worse but not improving. And who are the villains in today’s pollution? Almost all of us drive cars, park in driveways and lots, fertilize lawns. And we all use the toilet. Some of that hard-to-eradicate bacterial pollution has come from the Charlotte-Mecklenburg sewer system. Running beside most Mecklenburg County creeks is a sewer pipe. The system operates mostly by gravity – like the creeks, the sewage in pipes runs downhill, toward one of five Mecklenburg sewer plants, all on large creeks: the venerable Sugar and Irwin Creek plants, built in 1927, 13 as well as newer McAlpine, McDowell and Mallard Creek plants. In all, say Charlotte Water officials, the sewer system has 4,189 miles of pipes (and a jaw-dropping 105,444 manholes). Click image for larger view. Chart: Garrett Nelson, Danelle Haggerson. 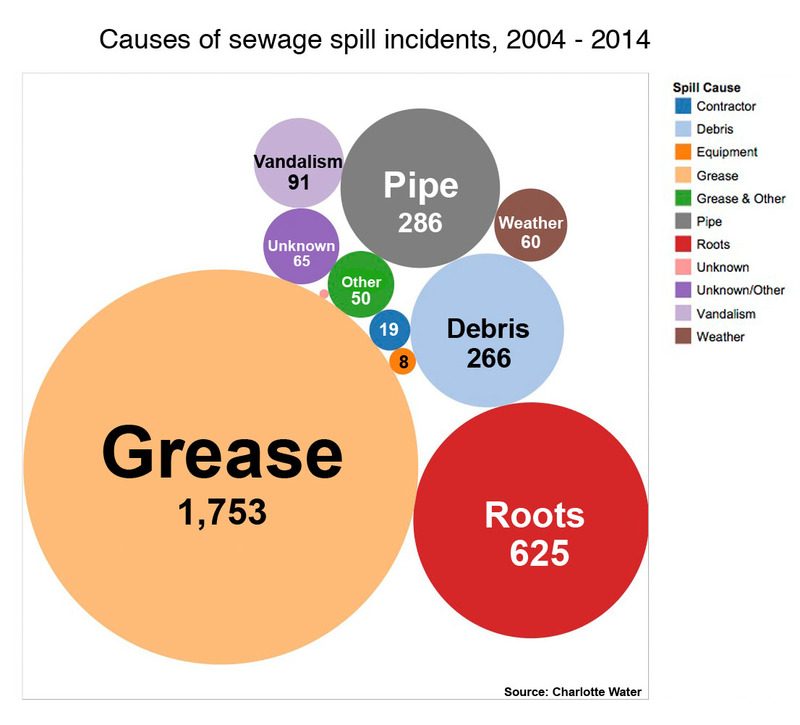 Each year sees hundreds of sewer line overflows, totaling hundreds of thousands of gallons of spilled sewage. 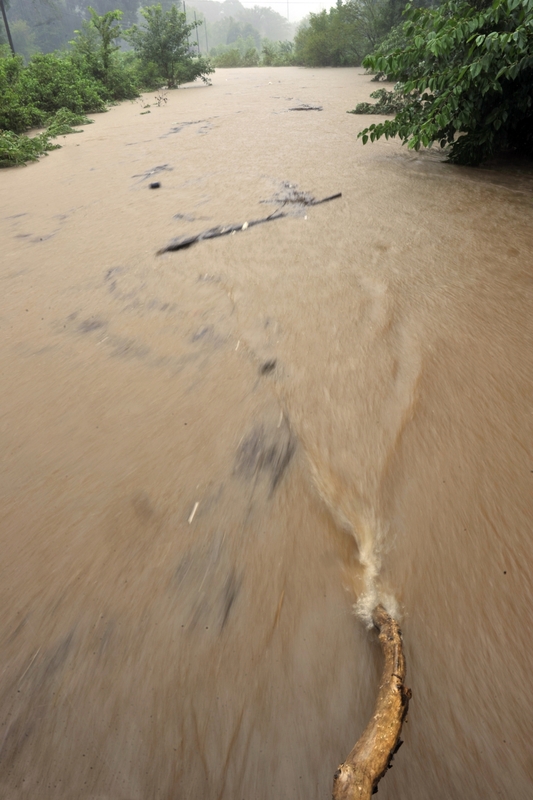 Officials at Charlotte Water, previously known as Charlotte-Mecklenburg Utility Department (CMUD), say they’ve worked hard in recent years to reduce the overflows, which can send untreated sewage into the creeks. 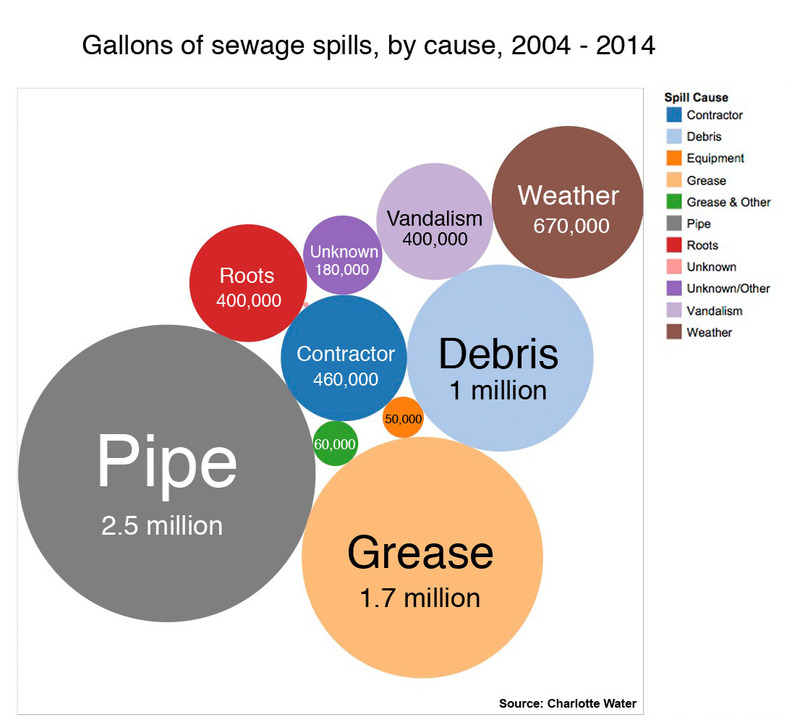 For the past 10 years, 2004 to 2014, records show more than 6 millions of gallons of sewage has spilled into the county’s surface waters. 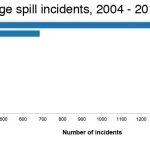 It’s not just spills. Charlotte Water’s five waste treatment plants are legally permitted to discharge a certain amount of pollution into the creeks, and in some creeks the discharges make up a substantial amount of the creek’s flow. 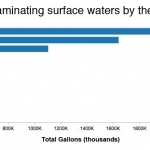 21 County water quality tests typically don’t show bacterial contamination downstream from treatment plants, but they do detect higher levels of nutrients, such as nitrogen and phosphorus. Today the creek once called a “smelly scourge” is a visible symbol of the potential for creeks to become amenities, not nuisances. The 2010 opening of a strategic segment of Little Sugar Creek Greenway near uptown has brought people close to the water again – bicycling, running or just strolling within view of uptown’s skyscrapers. The Catawba Riverkeeper Foundation, which advocates for clean water throughout the Catawba River watershed, regularly gets calls from people who notice problems in lakes, rivers and creeks. And, says executive director Gaskins, “Whenever a new section of greenway opens, we all of a sudden start to get a bunch of calls about that creek. To wade or not to wade? 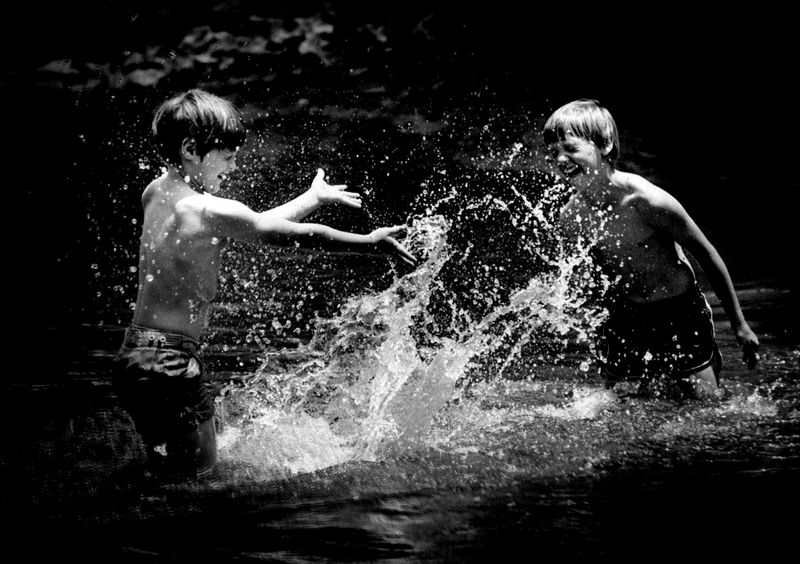 Back in 1996 Rusty Rozzelle got county commissioners’ attention by pointing out it was no longer safe for kids to play in the creeks. Their response: a policy to make the creeks safe for prolonged human contact – even for swimming. The goal remains elusive. But that doesn’t mean dipping a toe in Charlotte creek water will automatically kill you or is guaranteed to make you sick. At times, the creeks are safe for incidental contact. But it’s risky, since it’s hard to know at what times or where the water will have dangerous bacterial contamination. 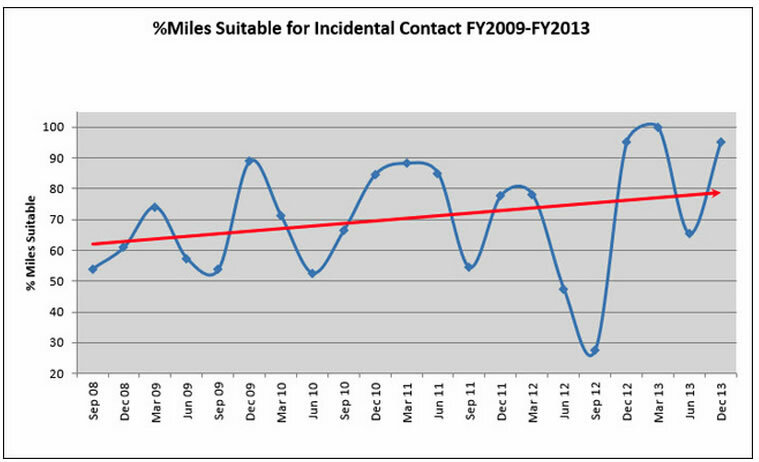 Percent of stream miles suitable for incidental human contact, from 2009 to 2013. Chart: Mecklenburg County. The county measures bacterial content in streams and regularly assesses what percentage of creeks are “suitable for incidental contact.” A 2009-2013 chart, for instance, shows how in December 2013, more than 90 percent of streams were considered safe for incidental contact. But in September 2012, less than 30 percent were. Rozzelle, in an interview, muses on whether he’d tell today’s version of an 8-year-old Rusty that creek water is so dirty he can’t play in it. “I grew up near Long Creek and … in the summertime, we walked up the creek channel and we caught frogs and fished and all that stuff. I’m sure I was exposed to all kinds of toxins. Which was probably not a good thing. Today, he’d teach that 8-year old how to know if the water looked or smelled bad, and what to do in that case. “I would educate him,” he says. * A note of disclosure: The Charlotte storm water education office of Charlotte-Mecklenburg Storm Water Services donated funds to assist with artist Stacy Levy’s educational project in Revolution Park, Passage of Rain, a part of the overall KEEPING WATCH on WATER: City of Creeks project. “The Grand Jury Reports,” Dec. 7, 1907, Charlotte Daily News; “Sweetness Comes To Sugaw (sic) Creek,” by Larry Jinks, Aug. 19, 1956, Charlotte Observer; “The Creek Is Simply A Sewer,” by Pat Stith, Sept. 15, 1969, Charlotte News. “Restoring the magic to Mecklenburg waterways” by Jerry Shinn, Sept. 28, 1996, Charlotte Observer. 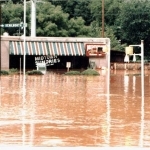 “Saving Our Creeks,” by Bruce Henderson, Nov. 3, 1996, Charlotte Observer. Charlotte-Mecklenburg Storm Water Services report, Microbial Source Tracking, Stewart Creek, March 18, 2014. Rick Gaskins, Catawba Riverkeeper Foundation executive director, interview March 3, 2015.